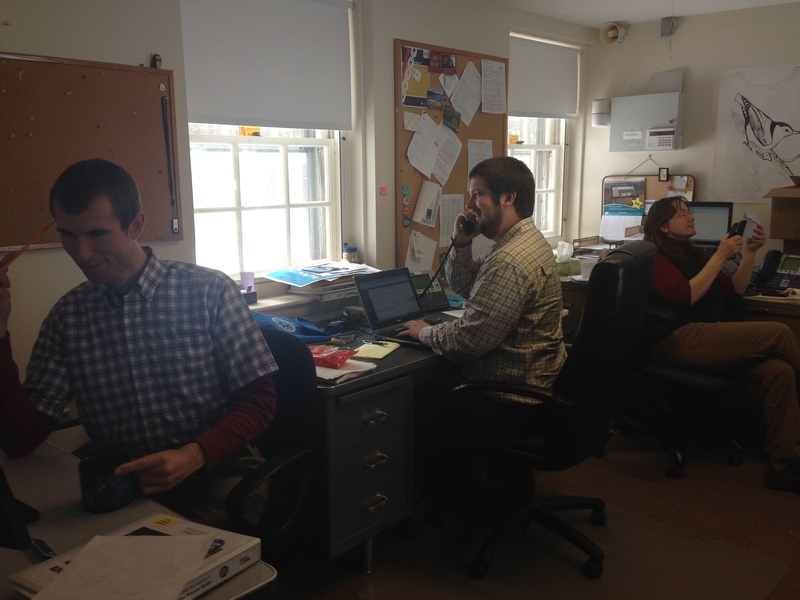 The Wildwood team hard at work! The Wildwood office has been humming over the last few weeks now that both Chris and Lisa are in the office working hard full-time to fill camper and staff slots. It turns out that sharing a small office is easy when everyone works so well together! We’ve found that many people who call in are curious as to how we find such amazing staff to take on all of the different roles that make camp so special for our campers each summer. The truth is it takes a lot of time and effort to recruit and hire as many as 40 summer seasonal staff in roles including cabin counselors, kitchen assistants, unit leaders, program area directors, trek leaders, and more. These folks come to us from a variety of places, often with a wealth of prior experience with either camp or a similar child enrichment programs. 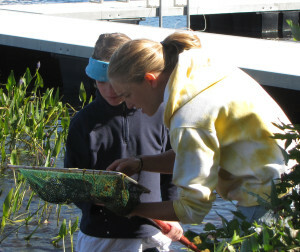 Elissa helping a camper discover life in the pond. The most important thing we consider when hiring new staff is whether or not these individuals are ready for the most important job in the world—caring for kids. Our most successful summer staff are those who understand the positive impact they can make on the life of our campers. We also look for staff who show a passion for the nature and the outdoors. Many of our staff each summer are undergraduate or graduate students who’ve studied Environmental Science, Biology, Conservation and other fields relating to what we do at Wildwood and Mass Audubon. If you or someone you know is interested in being a role model for campers this summer, check out the complete listing of Wildwood jobs at massaudubon.org/jobs under the Wildwood sanctuary tab. Some positions are still available for Summer 2014 but are filling quickly so act fast! This entry was posted in staff, summer camp on March 13, 2014 by Welch Narron.